The coolest mag around for young girls! Each month, Little Angel brings the coolest comps, the most awesome posters, the cutest cooking and DIY pages and the most giggle-worthy blush moments. Plus the mag is packed with inspiring advice, wacky facts, pet care tips, movie and gaming goss, so-fun quizzes and brain-busting puzzles. Aimed at girls aged 5-10 who love reading magazines but are too young for the tween publications, Little Angel is a safe, educational and inspiring space for young girls to play. It's entertainment to the max, and most importantly it's all about enjoying being a kid! 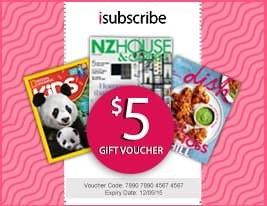 Unfortunately, due to postal restrictions subscribers may not receive the free cover gifts.Suitable for girls aged 5-10 years. Be the first person to tell us what you think about Little Angel (AU) and you'll save $5 on your next purchase!